At Dings and Dents, we specialize in minor collision repair – also known as “driveable” collision repair. Driveable collision damage is considered any body damage that doesn’t prevent you from being able to drive your vehicle. 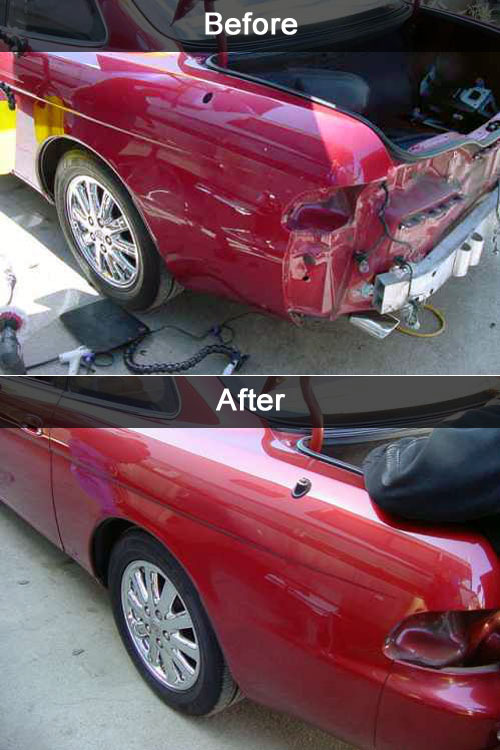 We combine expert workmanship with the highest quality techniques to restore your vehicle to its original condition. Whether you’re in need of a minor fender bender repaired, large dents, plastic bumper repair, paint scuffs and scratches, Dings and Dents can get the job done right. Our technicians take great pride in the quality of our work and in caring for your vehicle. They are able to match virtually any vehicle’s finish using our computerized color-matching process. All products and services used are of the highest quality to ensure the proper paint texture, gloss and finish. Many repairs can be done for less than the cost of your insurance deductible, however, if you are going through your insurance company we can assist you in getting your claim process quickly and efficiently. We go out of our way to make sure the process is smooth and hassle-free, keeping your satisfaction as our top priority. For immediate service, call or drive in today for a fast, FREE estimate. You can also use the contact form to the right of this page to reach us and someone will contact you within one business day.